These little pottery mugs are sold in Greece, especially on the island of Samos, and are based on a design that is supposedly about 2,500 years old. A simple piece of physics, although slightly deeper in philosophical terms.The cup looks normal, except that there is a central column inside the cup. If you pour water or wine into the cup, you can then drink it in the normal way. However you have to be careful when filling the cup. If you do not put too much liquid in, everything will be fine. However if you fill the cup beyond a certain point, the cup will empty - every drop will drain out from a hole in the bottom, and you won't get a drink at all.The cup incorporates an internal siphon!The cup is attributed to the Greek philosopher Pythagoras, who lived on the Island of Samos 2,500 years ago. As he wrote nothing himself, we only know about Pythagoras from the writings of other people, especially Plato. However as well as his fame as a mathematician, he is also celebrated for his philosophy and his way of life. 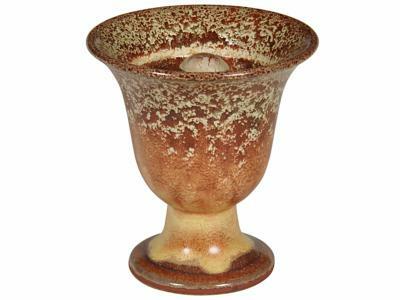 The Pythagoras Cup illustrates a point that we should not ask for more than our share in life, and if we are too greedy we might end up with nothing at all! The cup is 105mm high, and 95mm in diameter. The cup itself is very wonderfully crafted despite its intricate inner workings. More so,I greatly admire the effort that was taken to protect the item during shipping. Just a basic Pythagoras mug, works as expected.